Pay-per-pound airline tackles fuel crisis? The Derrie-Air says it’s the “world's only carbon-neutral luxury airline, where you don't have to choose between living the high life and saving the planet.” It plants trees to compensate for the damage planes make to the environment. The company also charges passengers based on their weight. “The heavier you and your luggage are, the more trees we'll plant to make up for the trouble of flying you from place to place,” its web site says. The new fare system will cost you $1.40/lb. to travel from Philadelphia to Chicago, for example. On top of that there’s no class distinction on board. Everyone is treated like royalty and every seat is first class. Already eager to join in? Just read the fine print first. 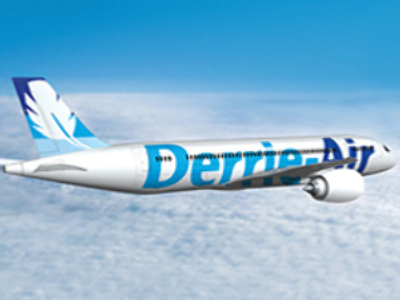 Derrie-Air turns out to be a hoax, a fake company dreamed up by Philadelphia Media Holdings publisher. The owner of the Philadelphia Inquirer and Philadelphia Daily News newspapers launched the bogus campaign to “demonstrate the power of our brands in generating awareness and generating traffic for our advertisers, and put a smile on people's faces,” as the firm’s spokesman said. The part with the smile was quite successful, as blogs comments show. People felt quite positive over the prank, although some said the disclaimer at the bottom was a necessary but regretful thing: “If you're going to pull a prank, JUST DO IT,” said one of the comments. Also bloggers wondered whether overweight people would feel offended by the idea, as it makes fun on their condition. “There will be massive picket lines (yes, pun intended) outside the Inquirer and Daily News come Monday morning,” predicted one of the users.